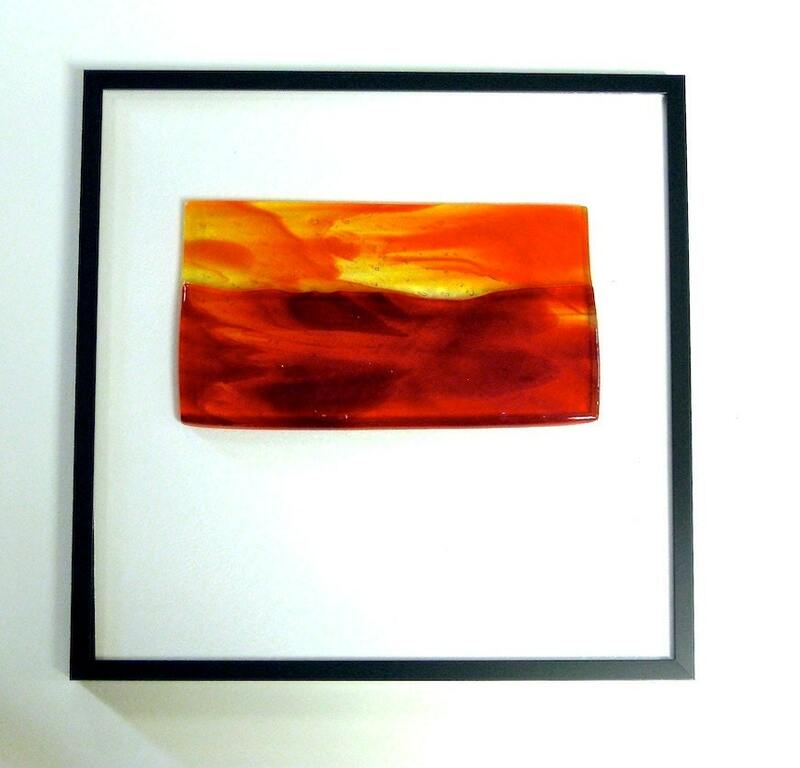 This contemporary abstract three dimensional sculpture art glass frame Sunrise Sunset picture will look great on your wall. The deep red art glass is fused to bright yellow glass to represent a slice of sunrise. The glass billet is raised and fused to a clear glass. Where better to find that light but in your home. We feel that our glass needs you as much as your office or home needs our glass. Many different layers along with clear give a ripple effect of colors overlaying each other. The texture of one, two and three levels makes secondary colors as colors overlay each other. All of our pieces are dramatically effected by the light. This studio piece is framed in a 12" X 12" black metal frame ready for hanging on the wall. Each Art Glass piece is one of a kind. Many require multiple firings to achieve the end result. The descriptions are what I see and feel as the artist. No photographs can completely capture the brilliance of the glass. All our glass is lead free. Enjoy our art. Express yourself by bringing art into your environment. Own a piece of Joy. I ordered this as a gift and the recipient absolutely loved it. It arrived well packaged as well. We want only happy customers. Any problem item should be returned within 5 days and we will credit the cost of the item. The return must be in original, complete and salable condition. No credit will be issued for shipping in either direction. The jewelry will be packed in a box for easy gift giving. I ship the jewelry priority mail with insurance and tracking numbers. The larger pieces will be packed in bubble wrap and peanuts. I will ship first class mail with insurance and tracking numbers. Once the package has left I will email you the tracking number. Our policy is to ship within 3 business days of receipt of purchase and payment. Any special shipping requests may require added handling, time and costs. Please request prices for any special requirements prior to ordering. We publish our shipping charges for the 48 contiguous states all other shipping locations we handle individually. Please convo me so I can give you an accurate quote for your individual purchases, method of shipping and ship to location. Please email me with any questions concerning custom orders, wholesale and consignment.